Show Racism the Red Card is working on an update of our educational film and education pack for release in the new academic year and football season. To date we have interviewed 62 players from clubs around the UK for inclusion in the film. The campaign wants the full interviews with players to be seen by as many people as possible. To make sure this happens, we have posted the full interviews with several players on our YouTube channel. 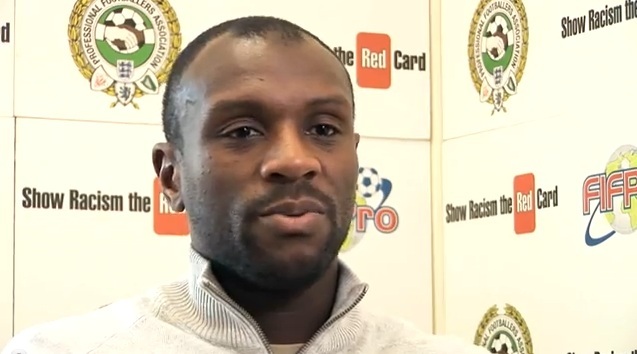 Visit now to see interviews with Emmerson Boyce (pictured), Kieran Gibbs, Ashley Young, Chris Samba, Yohan Cabaye (in French), Jonas Olsson, Jason Roberts, Jermaine Jenas, Wes Brown, Neil Taylor, Sylvan Ebanks-Blake, Karl Henry, Asamoah Gyan and Chris Hughton.